“A raucous new slice of punk’n’roll”. “Evil K was the first song we wrote with our new drummer, Andres. It was such an exciting time and this song felt like the start of something really special. I penned the lyrics after watching a late night doco on these ageing stuntmen whose childhood hero was ‘Evel Knievel’”. 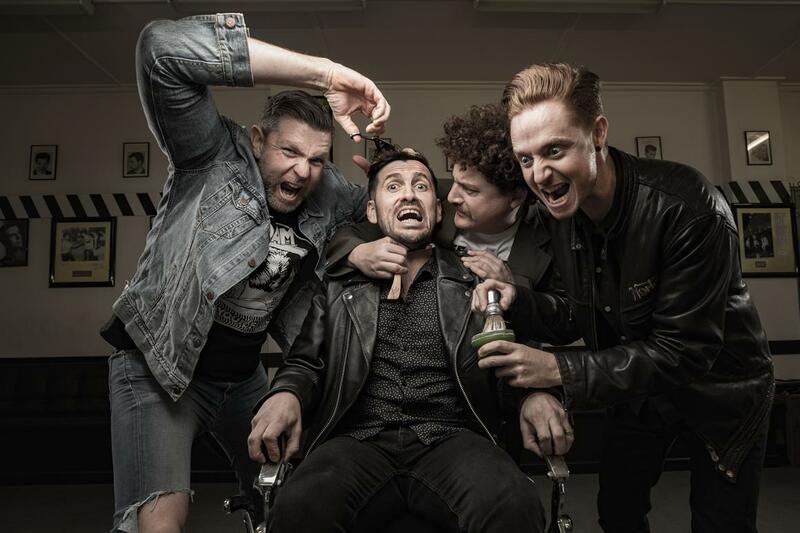 Since being crowned winners of triple j Unearthed’s 2013 Soundwave Festival competition, Born Lion have continually put out critically adored music, with three of their singles ‘D for Danger’, ‘Good Times Jimmy’ and ‘Good Dogs Play Dead’ all being added to rotation on triple j. Their 2015 debut album ‘Final Words’ was nominated for an ARIA for Best Hard Rock/Heavy Metal album. In the live arena, the band have traversed the countryside multiple times on their own headline tours and supporting the likes of The Hives, The Bronx, Royal Blood, Marmozets and Karnivool. To celebrate the release of ‘Evil K’ the quartet will head out on an East Coast run performing in Brisbane, Sydney and Melbourne. ‘Evil K’ will be available worldwide via Spotify, Apple Music, iTunes and all other good digital retailers on Friday August 18 through Four/Four. The Rumjacks have just announced another HUGE tour of Europe in 2017 through August, September, October, November and into December!! SYDNEY AND MELBOURNE SOLD OUT! SECOND AND FINAL SHOWS ANNOUNCED! …Not us though, we’re sick of it and are going to OFFICIALLY CALL IT QUITS after one last run of shows. This is it folks, we’re hanging up the suspenders, burning the banjo and putting London back in the cabinet! To celebrate our tenth anniversary and say farewell – we’ll be playing Too Late to Pray in full and a selection of our other favourites. We’ll even be releasing a very limited number of ‘Too Late to Pray’ 12 inch vinyl. We would love to see you all one last time – don’t miss it! Tim Rogers Takes Over Double J Radio! When Myf Warhurst heads to Ukraine to host this year’s coverage of Eurovision, she’s leaving the keys to the office to an old friend that we think you’ll know pretty damn well. We all know You Am I frontman Tim Rogers can write one hell of a song. And anyone who has seen him play live in the almost three decades he’s been on the live scene has concrete evidence of his talents as an entertainer. Fewer people know that he’s a bit of a gun footy player, had a decent crack at modelling and was, for a short time, a captivating TV host. But it’s all true. Hell, he was even Double J Australian Artist of the Year in 2015. Now, he’s adding radio to his disgustingly lengthy and varied list of talents, as he takes over Double J’s daily Lunch program while Myf is busy bringing Australian audeinces the glitz and glam from Europe. Tim Rogers hosts Lunch on Double J from Monday 8 to Friday 12 May at 11am. The jury is out and Pop Guilt by Screamfeeder is a killer album!